Valances or top treatments are specific treatments that are generally made to be placed at the top of the window opening. There are a great number of styles and most can be sized to proportionally fit your window. The complexity of the style can greatly affect the price and amount of fabric needed. Many people use a valance to provide the top frame piece of the view. 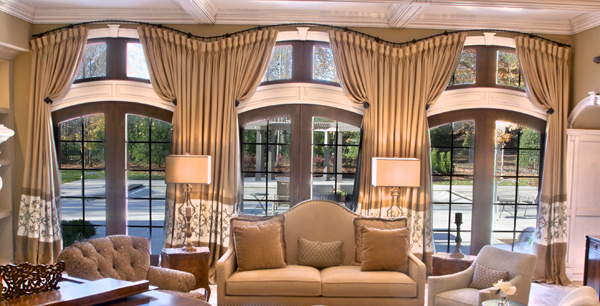 As we said before, good window treatments frame your view and add to the enjoyment of your home. Often, valances are used by themselves at the top of the window. Sometimes, they are used along with drapery side panels. The valance is a very versatile treatment with enough different styles so they can be appropriate and complimentary in any setting. Ask your designer or us how these can work for you.